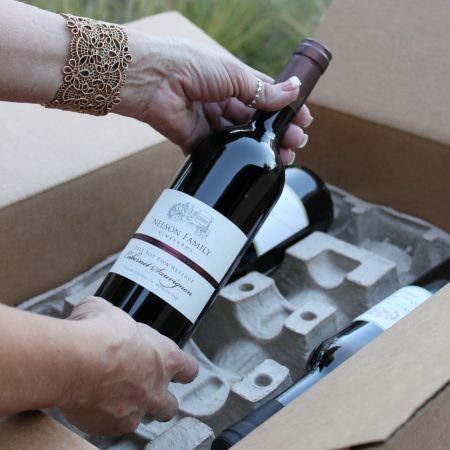 Join our club and you will receive a special shipment of Nelson Family Vineyards wine twice per year (April and October). We will send 4, 6 or 12 bottles per shipment of our very limited premium wines. You will have the option to fine tune your selection. As a club member, you will receive a discount on all wine purchases, including purchases made today! Your discount is based on the number of bottles you choose to receive per shipment. Discount: 4 bottles = 15%, 6 bottles = 20% and 12 bottles = 25% off! Members will also receive invitations to exclusive events and a special 10% discount on tasting room merchandise. This is our way of saying ‘thanks’ for becoming a member. You will also receive our newsletter, highlighting the activities at Nelson Family Vineyards, special notes from our winemaker, valuable information on our wines, extraordinary recipes, and information about limited release wines . The Nelson Family Wine Club makes a great gift. Sign up online for the gift membership that keeps on giving! We can tailor the gift to your specifications, just give us a call. In order to sign up for the wine club, just click on the “Add to Cart” button, then proceed to checkout. No purchase is necessary, however, you will automatically receive your discount on other wines you purchase today as well. Note that you will not be charged in the shopping cart for the wine club membership, though we will need your billing information for future wine shipments.